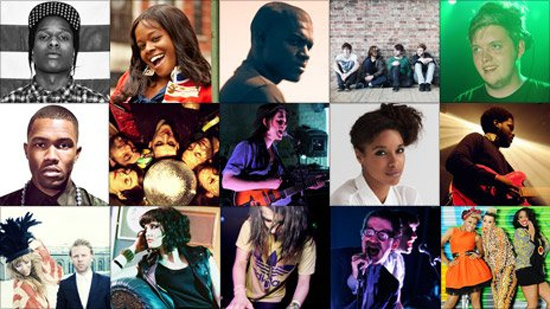 It's that time of year again - the annual longlist for the BBC's Sound of... list has been announced. The 2012 list is typically uninspiring fare for the most part, following neatly in the footsteps of previous years, won by the likes of Jessie J, Ellie Goulding, Little Boots and Mika. The full list runs as follows. As ever, it's hard to trust the notion of a 'Sound of 2012' when so few artists on here offer anything approaching anything remotely new, forward thinking, or even vaguely exciting. So this year we're offered flaccid folky indie from Dry The River, temper tantrums put to tape from Skrillex and Flux Pavilion, dramatic, bellowy electro-pop from Niki & The Dove, snoozy Later... fare from Lianne La Havas, et cetera. It's interesting to see long-running grime MC and producer Dot Rotten hitting the list at this point, given that he's been operating beneath the radar for several years. But then similar feats have been pulled as of late by Chipmunk and Tinchy Stryder (whose music with Ruff Sqwad helped define the genre in its early years). The attention being generated by Skrillex and Flux Pavilion's acne-ridden, greasy-haired moshstep, meanwhile, is utterly, hilariously mystifying in the context of an award entitled 'Sound of 2012'. Even putting aside Skrillex's recent collaborations with Korn aside for a moment, their music's sweaty thrashings are less relevant to dance music in 2012 than to the spoilt wailings of nu-metal circa 1998. Now that's backward-looking. At least in 2010 and 2011 we had the genuinely talented Joy Orbison and James Blake repping for UK-borne dancefloor styles. Elsewhere, though, as always there are a few great and well-warranted inclusions. A$AP Rocky's recent LiveLoveA$AP mixtape was promising indeed, though with the man himself occasionally slightly overshadowed by stunning production work from the likes of Clams Casino. Similarly, Frank Ocean's Nostalgia, Ultra mixtape was one of our favourite records of 2011, and established him as the most promising talent in the Odd Future stable. The winner is to be announced on 6th January, doubtless to be followed by a further flurry of media activity around the lucky recipient.